SIG Sauer entered the highly competitive 1911 market in 2004 with the 1911GSR, one of the first 1911s to come from the factory with an integral rail for mounting lights and lasers. Now the company has come up with a 1911 designed specifically for concealed carry: the Fastback Carry. Even though some feel the 1911 is too large and heavy for concealed carry, its relatively narrow cross section permits it to be easily concealed under suitable attire. And with the proper holster and belt it can be carried comfortably for extended periods of time. However, the bottom of the mainspring housing forms a sharp angle that often prints under clothing. It also tends to gouge the wearer in the ribs when getting in or out of chairs or automobiles. To rectify this, SIG Sauer rounded off the bottom of the frame and the mainspring housing. This reduces the grip signature and lessens the chances of it gouging while retaining the same feel and control of the 1911 platform. The frame and slide are machined from stainless steel with a Nitron finish. The ejection port has been lowered and flared so spent cases get out of the way reliably, and the low-mount Siglite night sights provide a fast sight picture and target acquisition in any light. Sharply cut grasping grooves (even on the rear sight) provide a firm purchase for chambering rounds or clearing malfunctions. As do all SIG Sauer 1911s, the Fastback Carry has an external extractor. The trigger guard is undercut to allow a high grip while the frontstrap boasts 30 lpi checkering for a nonslip purchase. The slide stop, magazine release and thumb safety are all moderately extended for positive manipulation, and the beavertail grip safety greatly improves recoil control. The long aluminum trigger can be adjusted for overtravel, and the skeletonized hammer provides a faster lock time. The lower section of the pistol is finished off with a set of attractive rosewood double-diamond grips that are sharply checkered to improve handling and recoil control. The four-inch match-grade stainless steel barrel is unique in that it splits the difference between the traditional Commander-size pistol (4.25 inches) and the Officer's model (3.5 inches). I believe that a four-inch barrel is the way to go on 1911s that are going to be carried concealedâ€”shorter than the Commander for improved concealability and longer than an Officer's for better balance, handling and ballistics. It would also be a practical choice for all-day holster carry by law enforcement personnel. I test fired the Fastback for accuracy with five brands of ammo. Despite its relatively short sight radius, it showed that it could shoot alongside its Government model kin any day of the week. All of my 15-yard groups were well centered, and none were larger than 2.75 inches while several came in around 1.5 inches. But it did prove ammunition-sensitive; light-bullet Federal and Remington loads consistently produced the tightest groups while both of the 230-grain loads printed high. I belted on a Gould & Goodrich 810 IWB holster and ran the SIG through a series of offhand drills at seven and 10 yards. Despite my preconceptions about the Fastback grip, it did not adversely affect overall handling or recoil control, but I did run into a slight problem. Whenever I attempt to shoot fast with a 1911 with a flat mainspring housing I shoot low, which is why I have the arched style on all of my 1911s. The Fastback's mainspring housing is flat and rounded, which tended to accentuate this tendency for me. The moderately extended controls on the Fastback allowed positive manipulation every time. I was especially taken with the grip safety, which would fully depress regardless of which grip I used or how tightly I held the pistol. And I'm glad to see more manufacturers beveling the magazine wells on their pistols as this greatly lessens the chances of fumbling a reload. In two range sessions my friends and I ran well over 600 rounds through the Fastback, and regardless of bullet weight, shape or ballistics we did not experience a single malfunction. The eight-round magazines supplied with the pistol have finger-rest base pads that extend down past the grip frame about a half inch, which is not only unsightly but also causes it to print under light clothing. When I carried the pistol concealed for a couple of weeks I used a seven-round magazine with a flat base plate, which eliminated the printing problem. 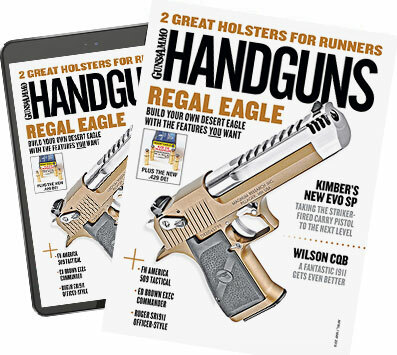 SIG should ship the pistol with a flat-base, flush-fit magazine. Other than that, I was impressed with SIG Sauer's newest 1911. If your idea of the perfect carry gun is an all-steel 1911 then you will find the Fastback Carry a comforting, reliable companion.